From drawing board to deployment in 2011, Israel completed the Iron Dome in a mere three years. The first two batteries-developed and financed entirely by Israel-took down dozens of Hamas rockets, making Iron Dome the first antimissile system ever to succeed in combat. The generous support of President Obama and the U.S. Congress enabled the construction of four additional batteries. Ultimately, 10 to 13 batteries and a full complement of interceptors will be needed to defend the entire country. Most ingeniously, the Iron Dome determines within split seconds whether an incoming rocket is headed for an open space or a populated area-and saves its fire for the latter case. Millions of Israelis live within the terrorists’ range, with as little as 15 seconds to reach a bomb shelter. By neutralizing most rockets headed for populated areas, the Iron Dome gives decision makers invaluable time to find diplomatic solutions. If salvos of rockets were pummeling Israeli homes, hospitals and schools, Israeli leaders would be under immense pressure to order ground operations that could yield significant casualties. By denying the terrorists a decisive offensive advantage, Iron Dome will save lives and prevent wars. Before Israel’s recent Operation Pillar of Defense, Gaza terrorists fired some 700 rockets and mortars at southern Israel, many of which were taken out by Iron Dome. Still Israel was forced to take action, mounting precise sorties against terrorists and launch sites. In turn the terrorists fired 1,500 rockets, some aimed at Jerusalem and Tel Aviv. These might have inflicted severe human and material loss, but Iron Dome downed nearly 85% of those headed toward populated areas. Combined with Israel’s world-class civil-defense system, Iron Dome thwarted the terrorists’ aim to wreak intolerable damage. Consequently, Israeli leaders had the time and space needed to join with U.S. Secretary of State Hillary Clinton and Egyptian President Mohammed Morsi in working out a cease-fire…. Iron Dome is thus a game-changer, but it isn’t a game-ender. 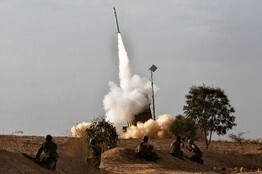 Terrorists on our borders have more than 70,000 rockets, and 15 of every 100 fired can still get through the Iron Dome. The danger even of conventional warheads is unacceptable, but nuclear warheads would pose an existential threat. That is why, together with the U.S., Israel has developed the Arrow to intercept orbital and suborbital ballistic missiles, and we have successfully tested David’s Sling, a long-range rocket-defense system. These innovations will not only protect Israel but enhance security for America and its allies world-wide.